Located in the fashionable West End district of Glasgow, this 5 star hotel offers guests comfortable beds with luxurious Egyptian linen and a nice relaxed style of hospitality. The 49 bedrooms and suites have been enhanced by a new bar and bistro and the makeover of many of the bedrooms. 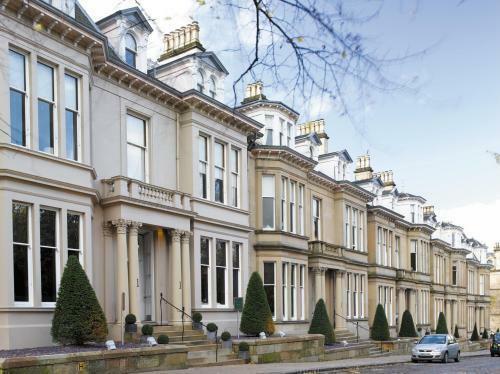 This is undoubtedly one of the best hotels in Glasgow and is popular with international celebrities. Bob Dylan and Madonna were amongst its first guests. More recently, they have seen the likes of George Clooney, Gwen Stephanie, Britney Spears, and Justin Timberlake. Spread over five Town Houses, a luxurious collection of bedrooms ensuring that guests enjoy the finest of comforts and relaxation. Every guest room individually designed and finished to the highest standard. Classical Victorian architecture meets modern boutique hotel. On the Bistro menu, which changes daily, there are great classic and modern dishes with a Scottish influence, all supporting the philosophy of quality food, cooked simply with the freshest of local ingredients and sensibly priced. Nice selection of wine available. Capacity for 78 diners, the popular oak panelled Bistro is an intimate and atmospheric dining room, which welcomes both resident and non-resident guests. The area is popular with tourists. Located in the fashionable West End district of Glasgow, a bohemian district of cafés, tea rooms, bars, boutiques, upmarket hotels, clubs and restaurants in the hinterland of Kelvingrove Park, the University of Glasgow, Glasgow Botanic Gardens and the Scottish Exhibition and Conference Centre, especially on the area's main thoroughfare, Byres Road, and on Ashton Lane.